Heritage Advertising specializes in creating custom auto tags, personalized auto accessories, windshield graphics, sale and event banners and magnetic signs. 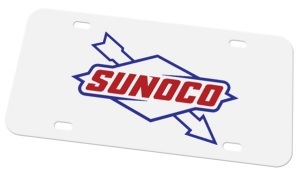 We make License Plate Frames, Holders, Covers and Brackets personalized with your text message. We also make Customized Auto Tags and truck plates. Experienced graphic designers lay out your custom auto tags from your logo, idea or sketch. WE help you design personalized vanity plates. Leave room for fastener holes, full bleed imprint is NOT available. There is an endless number of makes and models of domestic and foreign vehicles and thus different sizes of State License Tags so it is impossible to accommodate all vehicles to a single frame. As such we cannot guarantee a proper fit; although we will be happy to supply a free sample to check a proper alignment.